McQueen and Moffat share a moment at Monterey. Recognise the happy smiling faces in the photo? Maybe you should. 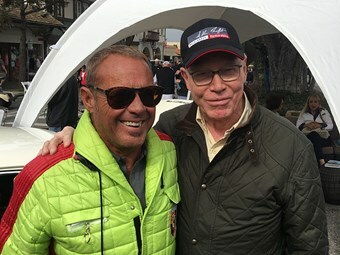 At left is Chad McQueen, actor, film producer and car racer (and, yes, son of Steve McQueen) and at right is local car race legend, young Allan Moffat. The pair caught up at the Monterey historic races this year, which saw a big Aussie contingent head over. McQueen has agreed to act as ambassador for the annual Motorclassic extravaganza in October. McQueen will lead the annual Tour Classica prologue from the Sidney Myer Music Bowl through the city streets of Melbourne to the Royal Exhibition Building. Presented by TAG Heuer, around 70 car and motorcycle entrants will take part in Tour Classica which takes off in the morning of Thursday 20 October, as the official welcome of Motorclassica 2016. As the 2016 Ambassador, McQueen will join Motorclassica for the weekend where he will participate in formalities, and meet and greet fans. He will also introduce a special feature of the 2016 event – a retrospective of his famous father’s cinematic catalogue. Chad McQueen himself produced a highly-acclaimed documentary in 2015: Steve McQueen: The Man & Le Mans, a film that recalled his own memories of being on-set with his father during the making of the seminal movie: Le Mans (1971). Motorclassica visitors will this year be given the rare privilege of viewing TAG Heuer Master Watchmakers at work and enjoy an exhibition of historical watches that celebrate TAG Heuer’s authentic roots in motorsport that began with dashboard chronographs in 1911 by founder, Edouard Heuer. The event happens in Melbourne on October 21-23 and you can find it here.